Vale's full-year 2015 earnings were pretty much what you'd expect. Here are the key takeaways. Vale SA (NYSE:VALE) reported a loss of $0.33 a share in 2015, down from a profit of $0.86 in 2014, but better than the $0.49-per-share loss analysts had been expecting. Revenues of around $26 billion were well off 2014's $38.2 billion and slightly above the $25.6 billion analysts were projecting. No matter how you slice it, however, 2015 was a very bad year for Vale. Here are the things you need to know. 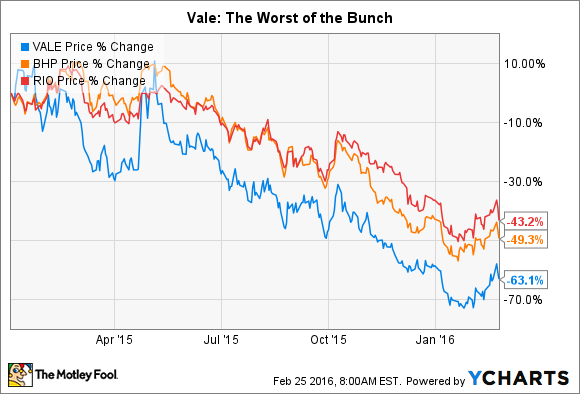 The biggest impact on Vale's results was a near across the board decline in commodity prices. Its iron business, which made up roughly 65% of revenues last year and around 83% of EBITDA was the most worrisome problem. Although Vale increased its output to record levels, showing strong execution on an operating level, the prices it got for what it produced fell drastically. For example, iron ore fines prices declined 36% year over year in 2015. This is no different from its peers, though, with Rio Tinto (NYSE:RIO) recently reporting that its iron ore price realizations in 2015 declined roughly 42% year over year. That price drop led to a 45% EBITDA decline in Rio's iron ore business. So it's bad all around in the iron space. But iron ore wasn't the only problem for Vale, just the biggest one. The nickel, copper, and coal operations were all hit by falling prices, too. The fertilizers segment was probably the best performer, with cost reductions and exchange rate changes behind a year-over-year improvement in adjusted EBITDA. So even here, the news wasn't actually great, just not as bad as the rest of the business. It was a year that Vale, and its investors, would like to forget. One area where Vale did some heavy lifting was cost cutting. It reduced operating costs about 24% last year, including a massive 65% decline in sales, general, and administrative expenses. And the Brazilian miner trimmed its capital spending by around 30%. That's in line with peers such as BHP Billiton (NYSE:BHP), which cut capital spending by around 40%, year over year, in the past six months alone. The deep cost cuts, however, haven't been enough to offset the weakness in the commodities markets. That's why Vale has also been trying hard to raise cash by selling assets and inking streaming deals. It raised $3.5 billion or so in this manner. The unfortunate thing is that debt was at roughly the same level at the end of 2015 as it was in 2014. This helps explain why the dividend was eliminated in late January. When all is said and done, Vale is clearly in survival mode, and at best, it's treading water right now. So things are bad at Vale, which is why the accident at Samarco, a 50/50 joint venture with BHP, is so troubling. A waste containment dam at Samarco burst late last year, taking lives and causing material damage to surrounding towns. That mine is currently not producing any iron ore, and the cost for cleaning up the damage is likely to be huge. So far, Vale has taken a $132 million impairment charge, but you need to juxtapose that against its partner BHP, which took a pre-tax charge of $1.2 billion ($850 million after tax). Adding to the concern here is that Brazil is looking for around $5 billion in compensation from Vale and BHP. Samarco is structured as a separate company, which Vale and BHP are trying to use to shield themselves from at least some of the liability. But it's still better to think of Brazil's $5 billion figure as a starting point in what is sure to be a long and drawn-out process. In other words, Vale's hit from this event is likely to grow from here. There's no denying that 2015 was a bad year for Vale. But it was bad for all of the major miners, including Rio and BHP. Vale is working hard to control the things it can, for example operating at peak production levels while cutting costs dramatically. However, it can't do anything about commodity prices. And the Samarco disaster is a wild card that isn't likely to go away any time soon. Conservative investors should see 2015 earnings as a warning sign.